We got quite a bit of work done over the past two weekends. I (Meredith) hadn’t been to the farm since November, so I finally got to see everything Gavin had accomplished. All the interior work on the service wall (the freestanding F-shaped wall that forms the kitchen, bathroom, laundry area, and hot water heater/electric panel area) was finally completed this weekend, and we were able to finish cutting the plywood sheathing panels, mount them, and finish them with the Rubio Monocoat oil finish. 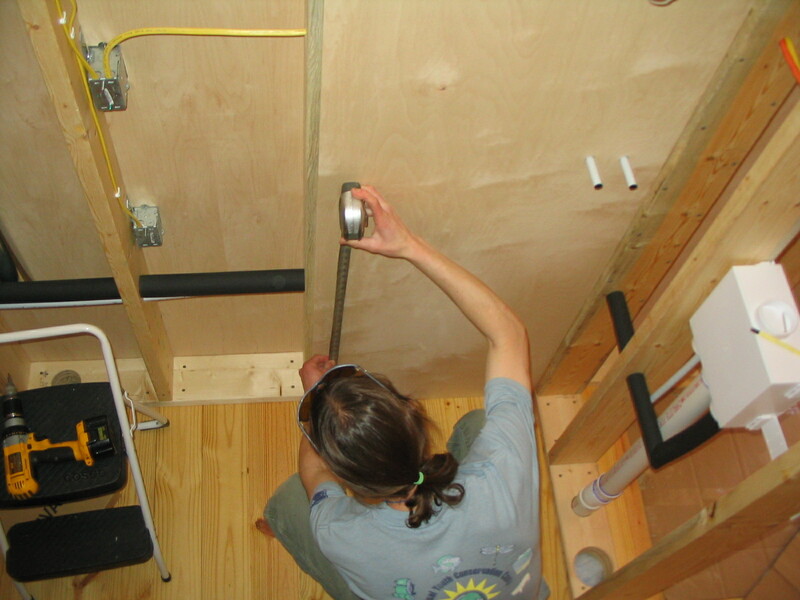 Here Gavin is using a drill to bore a hole in the sheathing for one of the plumbing penetrations. It was a lot of exacting work to get everything perfectly aligned. 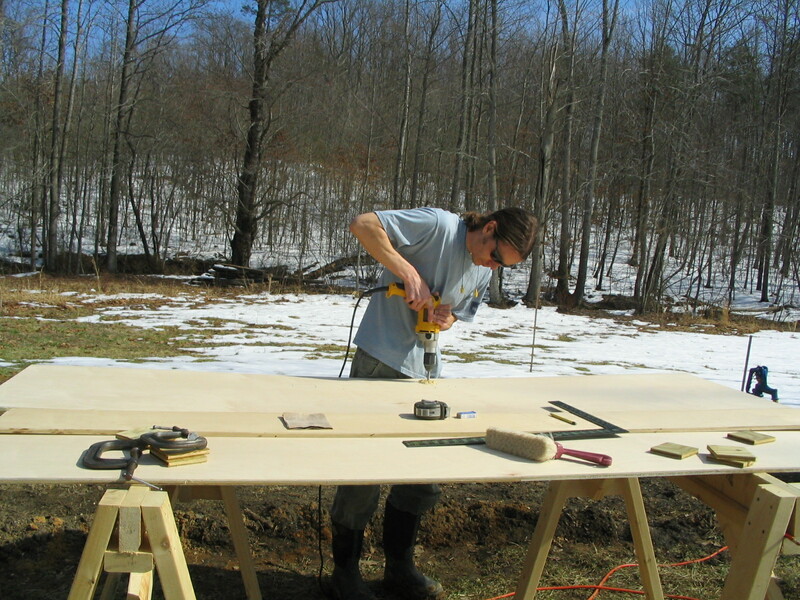 We measured several times before cutting anything, and luckily we didn’t have any noticeable mishaps. Light. 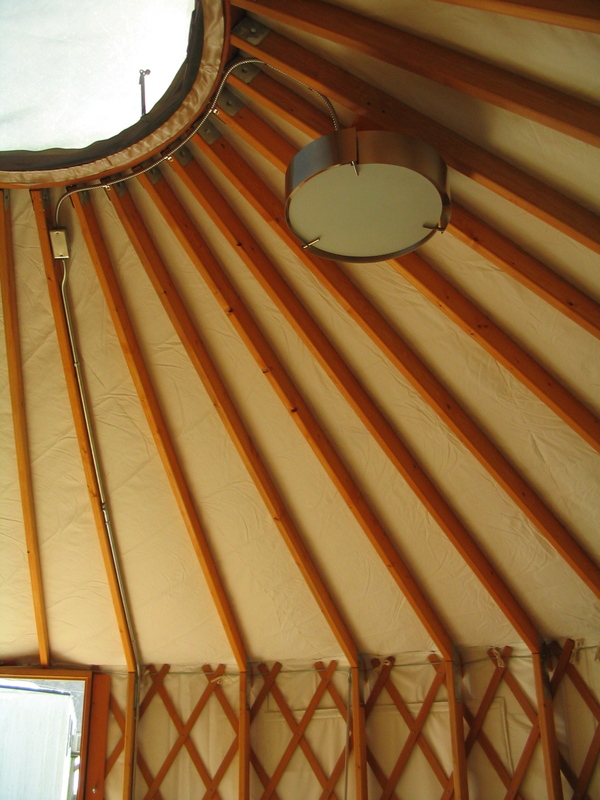 Here is a shot of the only overhead fixture we’ll have in the yurt. Gavin did a beautiful job of mounting it. It kind of looks like the dome is the sun and the light fixture is its moon. 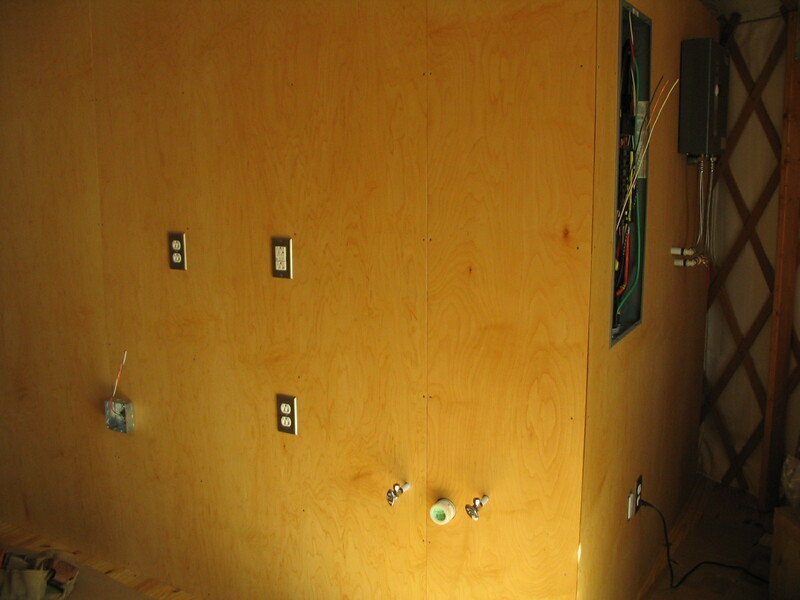 Here’s a shot of the kitchen side of the wall, and the electric panel and hot water heater around the corner. Working on the bathroom walls. Plumbing and electric work is finally done! This is looking up from the interior of the bathroom. 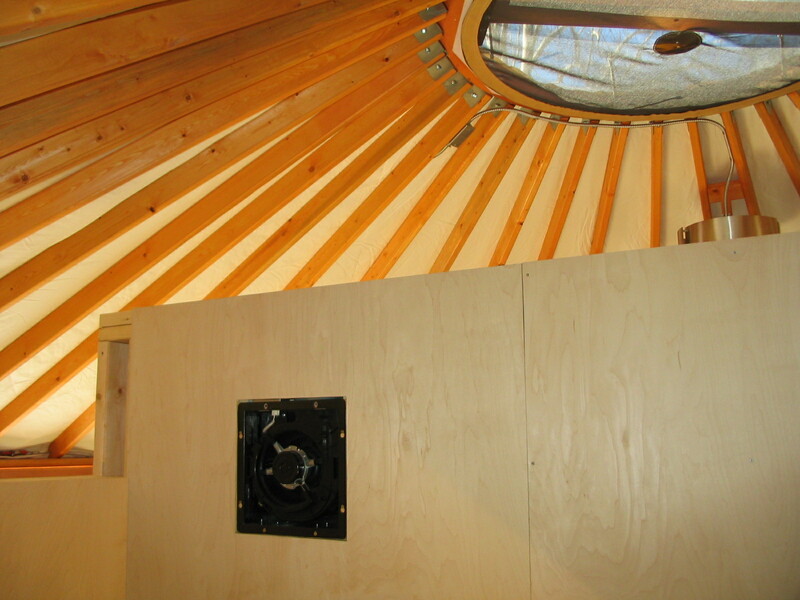 As you can see it is open to the rest of the yurt. The black square thing is the bath fan. We’re not sure how well it will work being that the bathroom is open like that, but we figured we had better put one in rather than be sorry later that we didn’t. Applying the oil finish. As you can see it’s pretty cold in the yurt since we have not had the heat pump installed yet. Now that we have the bathroom walls done, Gavin will be able to begin putting the fixtures in this coming weekend! He’ll start with the shower, then toilet and sink. This is pretty exciting for us because it finally feels like we are getting somewhere! your blog rocks! I can’t believe i didn’t know about it sooner! i ran into your mom at the store and she mentioned it, so now i’m hooked. i’m thrilled to know y’all are doin it up right living off the land and such. call me when you come visit. i’d love to talk to you and catch up. i’m running a small landscaping/gardening company and have been entertaining fantasies of turning my family farm back into a real working farm instead of just running cattle and turning the ground into clay. organic food scene is really taking off in rockbridge county, by the way. seeing y’all’s progress is really encouraging. hope yer staying cool in all this damn hot weather. Hey Ruth! Great to hear from you! Yeah, you should do something with the family farm. Keep that farmland open and productive! They aren’t making any more of it, and definitely not in Rockbridge. Glad to hear you are making a living getting some dirt under your nails!!! Can’t think of a better way to spend time.